This classic in the best sense of the word is now completely revised, updated and with about 35 % new content. 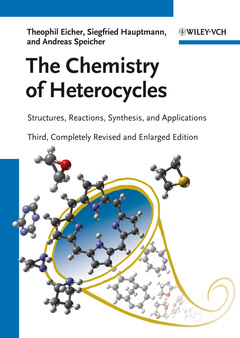 The proven ordering system according to the ring size of the heterocycles has been retained, while the important chapter on "Problems and their Solutions" has been re-structured and enhanced with up-to-date scientific exercises, resulting in a great tool for self-testing and exams. In addition, a new chapter on condensed heterocycles is included, as are a helpful index of name reactions and a chapter on nomenclature. With nearly 1,000 new literature citations, this remains a brilliant gateway to modern heterocyclic science for master and graduate students, as well as PhDs and researchers entering the field.